Many adults and older teens want all the benefits of orthodontics without the unsightly brackets and wires of traditional braces. With Invisalign, Dr. Ben Kacos helps improve smiles with this virtually invisible treatment. It is a modern approach to orthodontics using a set of custom-made plastic aligning trays. The treatment plan is precisely plotted out for a smooth, comfortable way to shift your teeth into proper position. No brackets, no wires — just you and your smile. Occlusion is the term dentists use to refer to the alignment of your teeth. Ideally your top and bottom teeth should fit together evenly, without crowding each other or over-spacing. All the biting surfaces of your teeth should line up without any unnecessary pressure; the points of the upper molars fitting in the groves of your lower molars. Also, for perfect alignment, the teeth of your upper jaw should slightly overlap the bottom teeth. Any deviations from this, dentists call malocclusion. Misaligned teeth are not only an esthetic problem, but they can also damage your oral health if left untreated. Some common symptoms connected with malocclusion include discomfort when chewing or speaking, speech problems and mouth-breathing. Other problems that can result from crooked teeth are unnecessary wear and tear on the enamel, TMJ disorders and increased risk of dental decay. When you meet with Dr. Kacos, he will take orthodontic records of your teeth including dental impressions that he will digitize. From there, he can create a 3-D digital image of your mouth and teeth. Then he will manipulate this image and plan out the precise movements of your teeth. A specialized lab produces the custom aligners corresponding to the stages of tooth movement in the 3-D rendering. 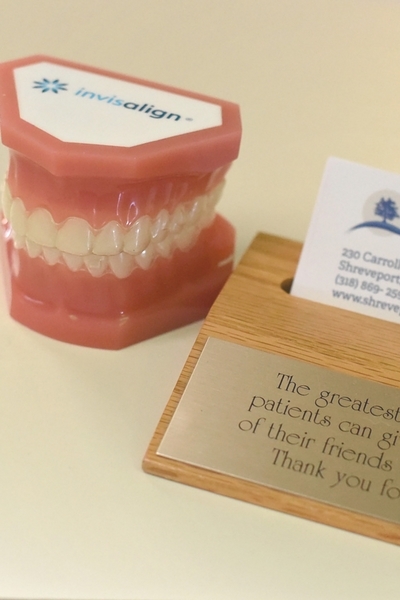 Once you receive your aligners, you change them out approximately every two weeks, until your treatment is complete. You will have intermittent appointments with Dr. Kacos to make sure things are moving along as planned. Each aligning tray puts precise pressure on your teeth, shifting them gradually into alignment. However, to achieve optimal results, you must commit to wearing your aligners as close to 20 hours a day as possible. This requires excellent cooperation and diligence. In this way, Invisalign is much like traditional orthodontic treatment. It takes time to move teeth into proper position and the length of treatment depends on the complexity of each case. On average treatment time takes about a year to a year-and-a-half. Ready to begin Invisalign Treatment?